This time of year I find myself thinking of summer – pastel colors, warm breezes and outdoor activities. 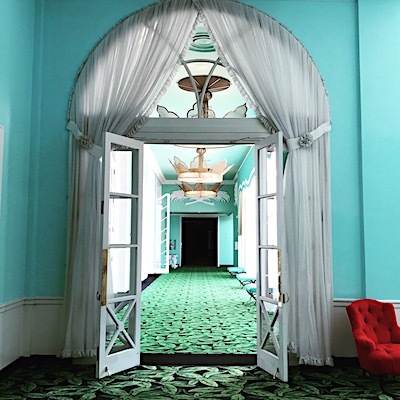 The Greenbrier Resort has been top of mind lately and I have a longing to visit again. 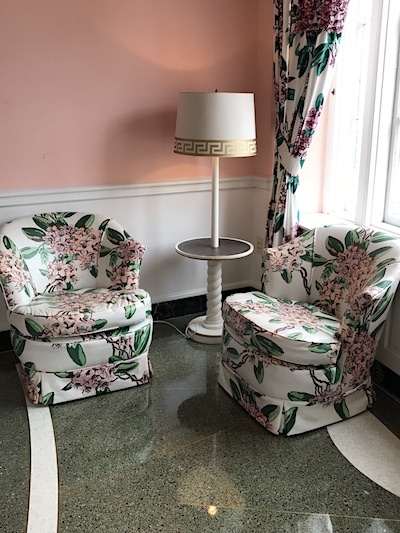 Last August I finally made my first visit to The Greenbrier. 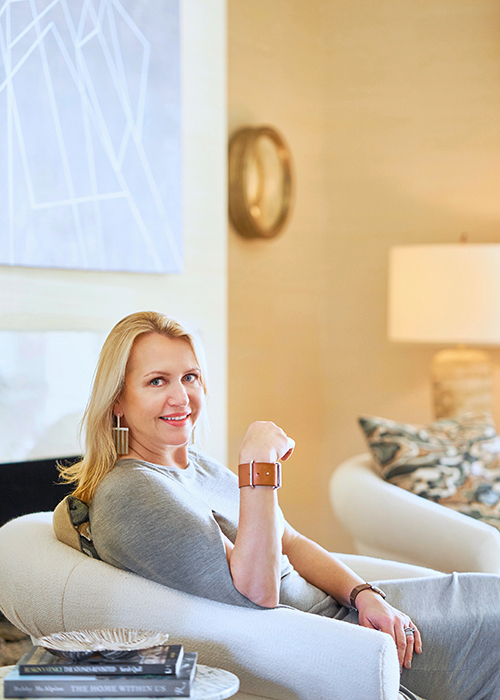 It was especially significant to me because as a child, my father had given me the book: The Draper Touch: The High Life & High Style of Dorothy Draper by Carlton Varney knowing I had an interest in interior design and decoration. I didn’t realize until years later how meaningful it was that he had given me this book and the influence it would have on my life path. 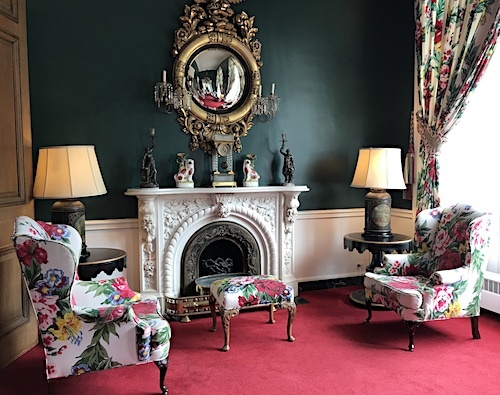 Finally visiting the Greenbrier was exciting. 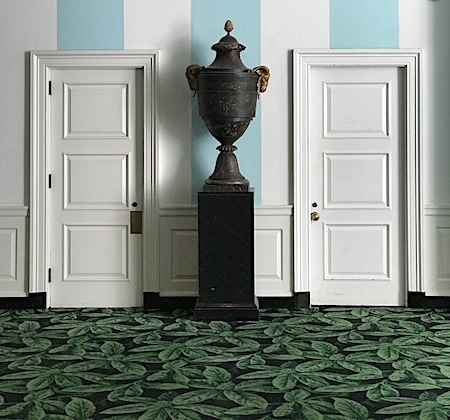 I knew I would love Dorothy Draper’s bold designs…but I didn’t realize how much I would enjoy the variations of rooms. The grand, southern hospitality is infused throughout the resort and the graphic, lavish decorated spaces went on and one. This grand American hotel was re-designed by Dorothy Draper in the late 1940’s after the war when it was used as a rehabilitation hospital. 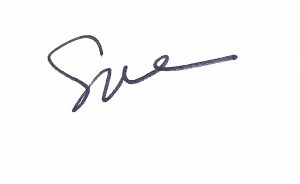 At the time, she was a high-society top interior designer and worked on the property until the 1960’s. 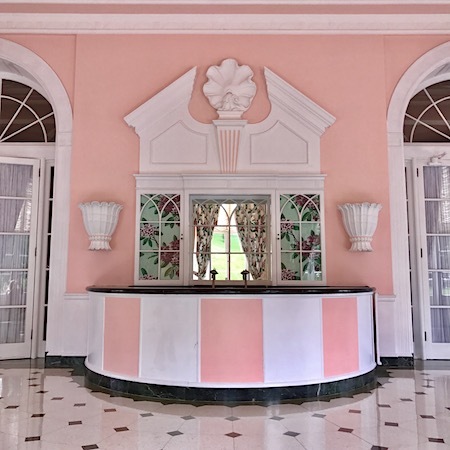 Thereafter her protégé Carlton Varney took over the design of the Greenbrier. The resort’s website says “Elegance and beauty never go out of style” and I think it’s very fitting for the hotel. 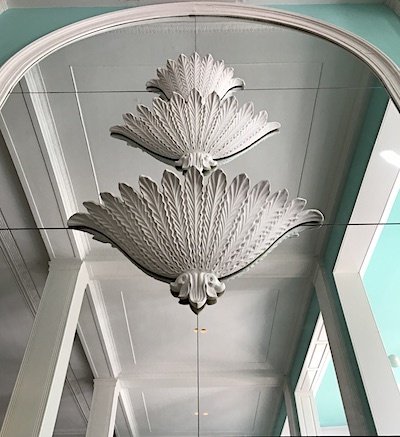 There is a timeless design quality to Draper’s spaces where icons of decoration coexist together – tassels, urns, plaster busts, archways, latticework, stripes, and floral chintz. These snapshots I took represent the interior design elements I like the best. They show the great variety of vibrant color themes in each area of the hotel and the confident, over-scaled furnishings and pattern mix. As a designer, the older I get, the more I appreciate theatrical statements like those of Draper’s interiors. A shot of the entry stairway that sets the tone for the rest of the experience. Turquoise is one of my favorite colors – I love how Dorothy used this so confidently in the lobby. 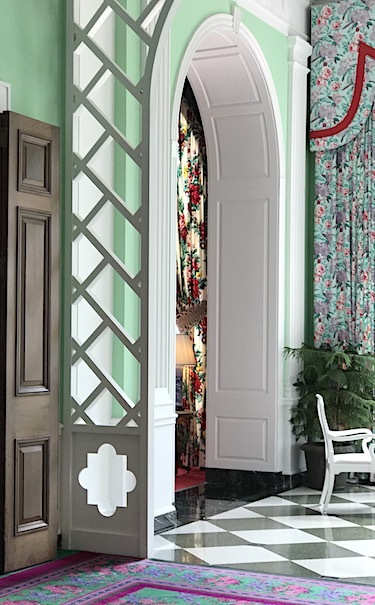 How cool is this conversion of pattern – the rug, next to the black and white marble floors, to the latticework, to mint walls and chintz draperies. 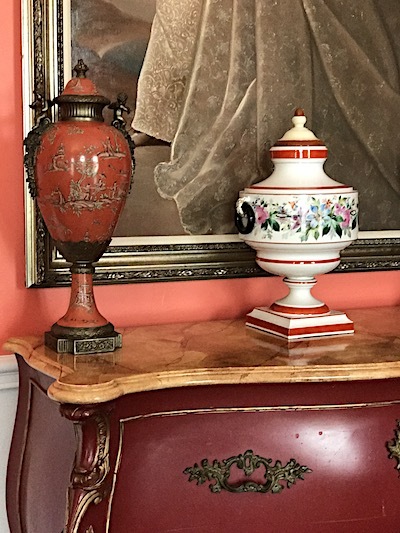 The classic urns, oil painting and French painted chest look so fresh against the coral painted wall. 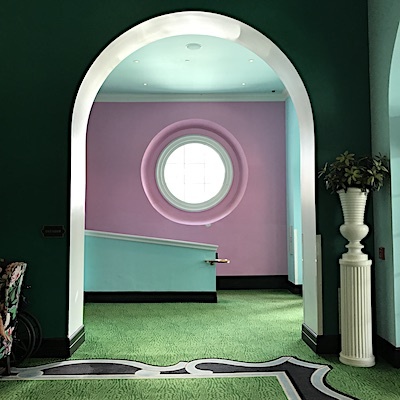 This view is so powerful – the circular window within the arch is highlighted by the lavender and deep green walls. So chic. The hotel’s version of a classic soda fountain where they served up white sulphur spring water to its guests. The oversized plaster shell and sconces are amazing. These complimentary colors of red and green are used in such a comfortable, classic way in this side library room. The oversized floral keeps it fresh. 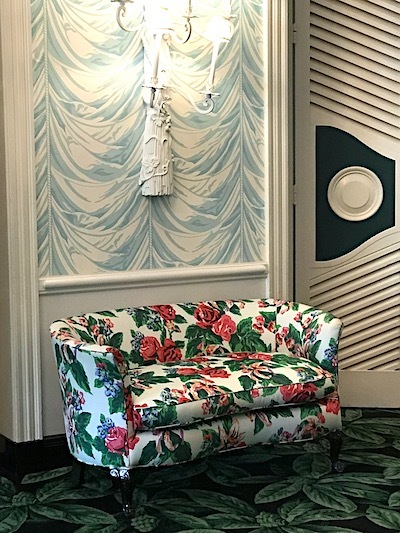 The “draped” wallpaper is so modern and current with the oversized white plaster sconce on it. Elements of this remind me of Jonathan Adler’s designs. Give me anything with stripes and I am hooked. 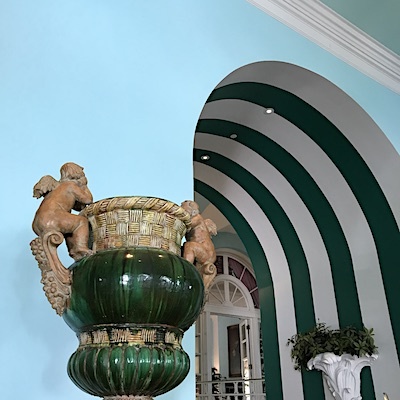 The turquoise & white awning stripes are grounded by the oversized urn and pedestal. 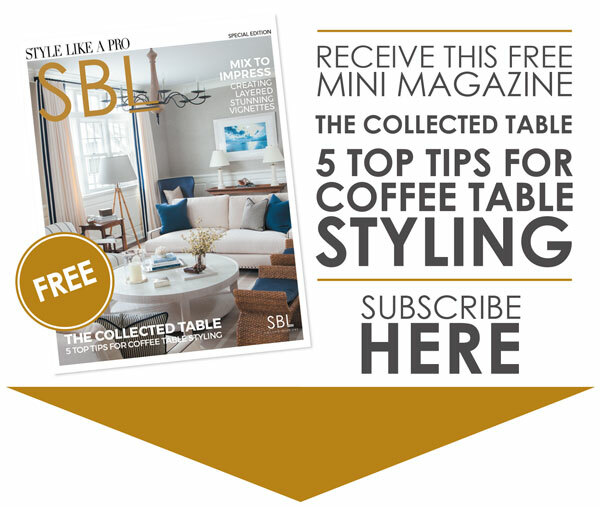 Draper inspired many interior designers – this room reminds me of a Kelly Wearstler design. Huge wall sconces in the stairway are mounted on mirror. 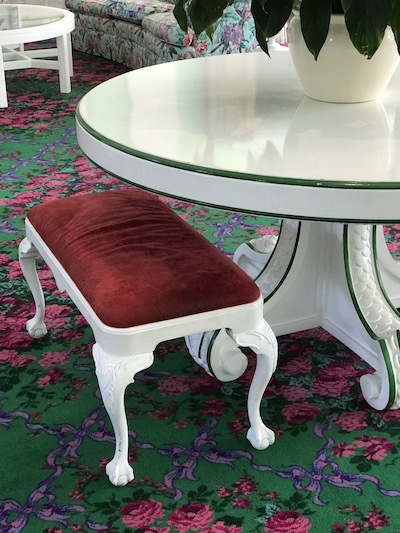 The gloss white painted furniture is so fresh next to the deep velvet and rich carpet. The green edging is so preppy. 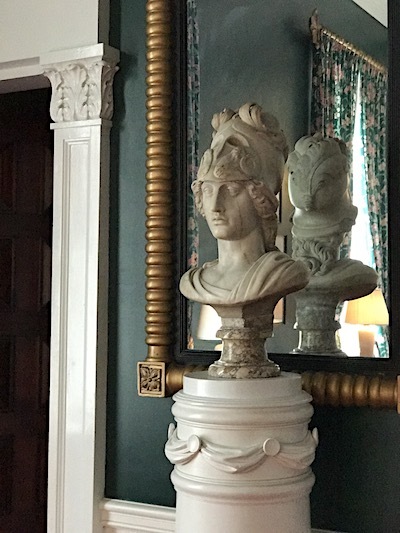 I’ve used this design element of pedestal and bust displayed in front of a mirror a few times since seeing this hallway. I love it. A quite corner in classic pink and green. Love the small details like the Greek Key embellished lampshade.